Mike Shoveller finally got an opportunity to play in the annual Rod and Joan Shoveller Memorial Tournament. The one named after his grandparents. The tournament is a men’s university basketball tournament, hosted during the winter break by Dalhousie University. Shoveller transferred to Dal last fall for his final year of university basketball; he played in the tournament for the first and only time. “To be able to represent your family and have them come watch you play for Dal will be a special feeling,” says Shoveller. Mike Shoveller (right). Photo by Trevor MacMillan. Shoveller is a 6’11 centre that brings rim protection, rebounding and inside scoring to the Tigers. He’s averaging 8.6 points, 5.3 rebounds and 1.7 blocks per game. His blocking average is second in the league. Rod and Joan Shoveller were dedicated members of the Tigers community. Rod Shoveller was a special events coordinator at Dalhousie and a referee for over 30 years. In 1991 he passed away and the Dal Tigers decided to name the tournament after him. He was inducted into the Nova Scotia Sport Hall of Fame in 1991. Rod’s wife, Joan, was a dedicated fan of Dal Tigers basketball and a volunteer. She volunteered at the Nova Scotia Sport Hall of Fame after Rod was inducted and was named volunteer of the year in 1998. Joan Shoveller passed away in 2014 and the Dal Tigers renamed the tournament to the Rod and Joan Shoveller Memorial Tournament. Mike’s father, Bruce Shoveller, is the son of Rod and Joan. Bruce Shoveller said his parents would be proud of Mike. Shoveller previously played for Queen’s University Gaels. In his fourth year with Gaels, he travelled with the team to Halifax for the tournament but wasn’t able to play. “I tore my ACL and ended up missing that entire year, but to be present and have people come up to me and tell me different stories about my grandparents, was really nice,” says Shoveller. The tournament is emotionally important for Mike Shoveller. He played in front of his family and his grandparents’ friends at the tournament. The Tigers’ first game of the tournament was on Dec. 28 when they played Mount Saint Vincent University. Dalhousie won 84-42, Shoveller had seven points and eight rebounds. 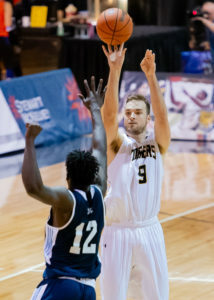 The next day, the Tigers played Cape Breton University and won 76-62; Shoveller had 19 points – one behind Alex Carson for the team lead. In the championship game against Saint Mary’s on Dec. 30, Dal lost 69-64. Shoveller had eight points and was named a tournament all-star.